Sussex captain Luke Wright says ‘awesome’ Jason Gillespie has established a calming environment for the squad ahead of Saturday’s Vitality Blast Finals Day. 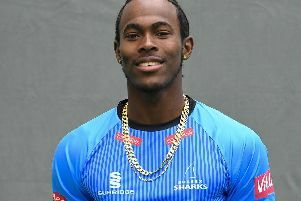 Gillespie, appointed head coach last November, has brought fun and has taken pressure off players, according to Wright, who will captain the Sharks in their first Finals Day for six years this weekend. The 33-year-old said everyone from the young players to the senior squad members had enjoyed the season. He said: “He’s been awesome. He’s just made it a really calm environment. He’s brought fun and he pushes the guys to train the way we’re training to expect a lot of ourselves. Wright spoke of the pride he will feel leading Sussex into their Finals Day semi-final with Somerset, which starts at 2.30pm. He said: “I’ve been proud to lead them out all season, and to lead them out in the semi-final on Finals Day will be a very proud moment. I think for the whole crowd they get their day out at Edgbaston. “Obviously you want to win it but I’ve played enough cricket to know that it’s all on the day, who’s in form, who handles the occasion better. Wright praised the standard and competitiveness of the Blast. Sussex came through a competitive south group and won well at Durham in the quarter-finals. Wright said: “It’s been really tough to get out the group. There have been some quality teams and you only have to look at the teams who didn’t come through – Surrey with their line-up and even Hampshire who I think are normally one of the teams that make Finals Day, so there’s some great teams not making it – the standard is very good. The Sussex skipper says the side deserve to be at Edgbaston and he was always confident they had a chance of reaching the showpiece day, which is live on Sky Sports for those Sussex fans who can’t make it. Wright added: “I knew that those last few games were getting more and more important. The last three games (which Sussex won) were almost knockout stage but if you’re going to win it you need to be able to play in those sorts of games.